The Booths, of Old Hall Farm, Feizor, submitted both title-winning pens of ten and 20 Mule gimmer lambs at the annual highlight, the first major and one of the best-known sales of its kind in the north, which, despite a hard winter and spring, notably for hill farmers, again attracted an entry of over 7,000 quality sheep. Robin Booth is pictured centre with his victorious pen of ten Mules, joined by judges and sponsors. The renowned family of Mule breeders also sent out the champion pen of 20’s at the 2012 NEMSA fixture, with Robin Booth exhibiting both victorious home-bred pens at this year’s renewal. It was the first time they had achieved the NEMSA supreme double. “It’s tremendous – we’re delighted,” said Robin afterwards. Their champion ten-strong pen, six of which were by home-bred ram lambs, sold for the day’s top price of £240 per head to the Hall family in Littondale. Robin Booth is pictured centre with his victorious pen of twenty Mules, joined by judges and sponsors. 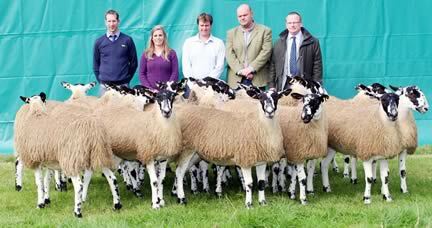 The Booths’ triumphant pen of 20’s, 13 of which were by their well-known Bluefaced Liecester ram Smearsett D15, overall supreme champion at Kilnsey Show three years ago, were knocked down at £230 per head when returning to North Craven with Settle’s John Wilson. The Booths also sold a third pen at £158 apiece, as well as picking up a special CCM prize for the highest flock average of 100 or more lambs when their 135-strong consignment achieved £150.36 per head overall. The second prize pen of tens from Barden’s Stephen Fawcett sold for the day’s second highest price of £235 per head to the Sandham farming family in East Carlton, Yeadon, who also snapped up Mr Fawcett’s third prize pen of 20’s at £175 each. The same vendor achieved the highest flock average for under 100 lambs when the Fawcett consignment of 84 Mules averaged £142.10 per head overall. Reigning tens’ champion and multiple title winners Ashley and Rachel Caton, of Otterburn Lodge Farm, Otterburn, were again to the fore when presenting the third prize pen of ten, which found a new home in Norfolk when falling for £194 per head to Ben Harvey, of Henry Harvey & Son, Waxham. Mr Harvey also paid £160 each for the fourth prize pen of tens from JC Walker & Son in Dunsop Bridge. The Catons were also responsible for the second prize 20’s pen, which made £180 each on joining Claire Morris in Barnard Castle, a regular buyer of the family’s Mules at the fixture. 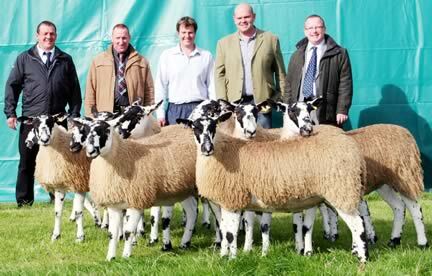 Their entry of 157 lambs achieved the second highest flock average at £123.24 per head. Title winners in both show classes received Ciba Geigy perpetual trophies, with the champion pen of tens, judged by Graham Jackson, of Bentham, and Stuart Hudson, of Ashbourne, also awarded the Chester Kneller Memorial Trophy. Judges in the 20’s class were Hannah Brown, of Bedale, and Stuart Rogers, of Barnstaple, with the show sponsored by Chris Pearson, of Pearson Farm Supplies, West Marton, and Armstrong Watson Accountants & Financial Advisers, represented by Skipton office manager Jonathan York, who is also responsible for agricultural clients. 6 K Fawcett, Barden, £152 to J&E Greenhalgh, Bashall Eaves. 6 CD&RF Kitching, Threshfield, £131 to GH Fuller & Son, Milton Keynes.